Of the more than 100,000 comments submitted to the U.S. Fish and Wildlife Service (USFWS) on the Mexican Wolf Draft Recovery Plan, more than 99 percent were in support of recovery, according to wildlife conservation organizations who reviewed the comments submitted this summer. “We wanted to be able to definitively say that the recovery of the Mexican gray wolf is important to Americans, and we can,” said Hailey Hawkins, Southern Rockies Field Representative for the Endangered Species Coalition. 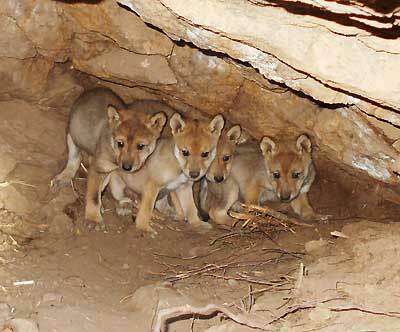 “Americans overwhelmingly support Mexican wolf recovery and the U.S. Fish and Wildlife Service’s recovery plan needs to reflect that,” said Hawkins. Seven organizations and dozens of volunteers came together to tally the comments, publicly available on the government comment portal, Regulations.gov. The organizations included the Endangered Species Coalition, Grand Canyon Wolf Recovery Project, Lobos of the Southwest, Wolf Conservation Center, White Mountain Conservation League, Sierra Club’s Grand Canyon Chapter, and Sierra Club’s Rio Grande Chapter. It took weeks and over a hundred hours for the volunteers to tally the thousands of comments, which came from all 50 states. The comment period was open from June 30, 2017 to August 31, 2017, during which time USFWS received more than 100,000 comments on their Draft Mexican Wolf Recovery Plan. The last recovery plan was drafted in 1982 and has been in critical need of updating. The current draft recovery plan must be completed by November 30, 2017, as mandated by a court order. Most commenters are worried that the USFWS draft recovery plan wasn’t based on the best available science in its calculation of wolf recovery goals, and that barriers to habitat connectivity weren’t adequately addressed. For instance, the proposed plan calls for only about 300 wolves in the Southwest United States, even though biologists on the USFWS’ own Science and Planning Subgroup calculated that a population of at least 750 wolves should be established before delisting. This was just one of a number of intentional blind spots on the science of wolf recovery adopted in the proposed plan. The Mexican gray wolf is one of the rarest mammals in North America, with only 113 individuals in the wild. There are many hurdles hindering the recovery of the Mexican wolf, including poaching, declining genetic diversity, and federal legislation aimed at removing protections for the wolf. The Mexican gray wolf was almost completely extinct when it was listed under the Endangered Species Act in 1976. Shortly after, a captive breeding program was initiated with the only five remaining individuals. After 30 years of absence, the Mexican wolf finally returned to the American southwest when they were released to the wild in 1998. However, after almost 20 years, the endangered Mexican wolf is still struggling to recover due to a lack of investment in scientific recovery requirements. Without a strong recovery plan from US Fish and Wildlife Service, it is unlikely the Mexican wolf will fully recover from the brink of extinction. For more information about the Mexican gray wolf, visit www.mexicanwolves.org. Wolves are important to the eco system. We have to respect them. They should not go extinct. Save the wolves by releasing them. Please save them and stop the killing!!! We can not call ourselves humans if we can’t even have compassion and save our kin that live with us in this world. They are part of the circle of life as God created them to be. NO TROPHIES and NO EXTINCTION! Our beloved wolves have been proven by science to be a keystone species, absolutely essential to a healthy ecosystem which supports human life! If we want to continue to live we must have wolves. I have known wolves personally and experienced great spiritual growth in their presence. Their true value is far beyond the science. Help us get the word out and educate the public for Mexican wolves. We need all of the help we can get. We must save the wolves! Trump opened up hunting in an animal SANCTUARY in Alaska!! Hunters can slaughter wolves and their cubs and bears and their cubs. As if that wasn’t bad enough, they can “hunt” from HELICOPTERS! !